Mmmm Stuffed Shells of any type make my mouth water. I found this idea from a Pillsbury book, a long time ago and I still love it. The best part about this meal is that not only does it taste wonderful, it freezes really well. In fact, the whole recipe can be made relatively quickly and provide many servings. I believe that this recipe can make about 12 or more individual servings (about 4 shells per person, with sides). See what I mean? I had friends coming over for dinner and I also wanted to make a tray of food for another family friend. This was a perfect opportunity to make food that looked fancy, easy to make (and in bulk) and reheated nicely. I served this with my Chicken and Spinach Salad and Pesto Bread Sticks. Enjoy! Cook pasta shells, as directed by box. While pasta is cooking, brown beef, breaking up beef as much as possible. Remove from pan and drain fat, leaving about 1 tablespoon. Add beef, salt, pesto, kidney beans and mozzarella cheese, mixing well. 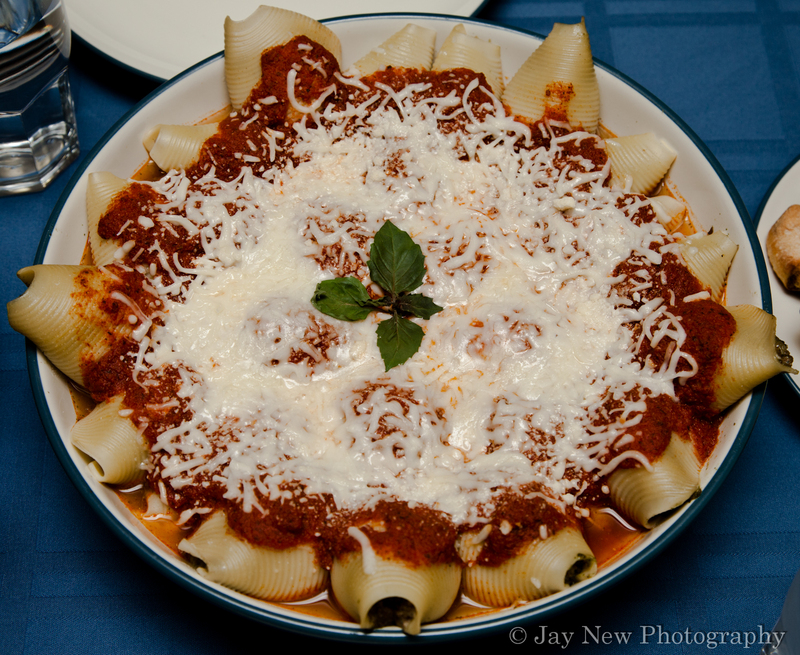 To assemble Minestrone Stuffed Shells, take one of the shells from the pot of cold water and shake off any excess water. Fill each shell with about 1/8th of a cup of minestrone filling and place each down, open side down in a freezable tray or (microwavable or oven safe) serving tray. Once all the shells are used (or you run out of filling) spoon generously, pasta sauce over all the shells. Once cooled, you can wrap tray with saran wrap or foil and freeze. When ready to serve Minestrone Stuffed Shells, defrost shells and either microwave for about 6-8 minutes or bake in oven at 375 F for about 15-20 minutes or until cheese are melted and pasta is heated through. Yum, this sure looks impressive without having too much work! I love the pesto sauce too! Thank you Crustabakes 🙂 It was a huge success that night. There was only 4 shells leftover. When my company came over, they were surprised I wasn’t busy in the kitchen and kept offering to help. Little did they know that everything was prepared in advance and all I had left to do was put it on the table. Success!! Lovely recipe! looks so mouthwatering. This is brilliant. I didn’t know that jumbo pasta shells existed, not where I live anyway. It would be a mess-free and convenient way to eat. Sometimes you find jumbo but medium shells work well too. If you can’t find them, just mix some small shells into the mix 🙂 I hope you do find them! I can’t think of freezing pasta without thinking of that episode of the Sopranos where Janice defrosts the wife’s ziti. (The guy’s wife died and he never wanted to defrost it, so evil of her.) Also, we have a great Pillsbury book. We got it way back and it’s just for baked goods, but we still use it. Katherine wants to make your breadsticks. And finally, this looks good.